Browse: Home / 2019 / March / 28 / Philly Has Two Shows This Weekend and One World Title Bout! Philly only has one world champion in IBF World Super Featherweight Champion Tevin “American Idol” Farmer who defended his title earlier this month in Philly. This weekend there are two shows with a second world title fight this month in Philly on Saturday. 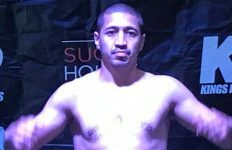 On Friday Marshall Kauffman’s Kings Promotions and Andrew Foy’s Titans Boxing Promotions will be at the SugarHouse Casino at 1001 Delaware Avenue, featuring five eight rounders. On Philly boxer on the undercard is debuting middleweight LaQuan Evans who will be taking on debuting Jordan Demko, from Birdsboro, PA, to open the show. From nearby Philly is Upper Darby’s Super Middleweight Brandon “Bro” Robinson, 11-2 (8), coming off a loss looking to get back in the winning column taking on Troy “Omar KO Artist” Artis, 5-9-1 (3), from the Bronx, NY, over 8 rounds. In other eight rounder’s Super Bantam Anvar Yunusov, 6-0 (3), from Tajikistan, living in Reading, PA, takes on Carlos “Mango” Colon, 5-1 (3), from Hatillo, PR. Super Light Raeese “The Beast” Aleem, 13-0 (7), of Las Vegas, takes on southpaw Ramiro Robles, 15-8-2 (9), of Queretaro, MEX. Super Featherweight Anthony Mercado, 12-4 (10), of Arecibo, PR, takes on Andres “Pajita” Navarro, 11-7-1 (7), of San Juan, PR. Super Welter southpaw Erik Spring, 11-2-2 (1), of Reading, PA, takes on southpaw Terrance Williams, 5-2-1 (1), of York, PA. Filling out the card in three six rounder’s are HeavyweightsMichael Polite Coffie, 5-0 (4), of Brooklyn and Colby Madison, 7-0-2, Owings, MD, in separate bouts. 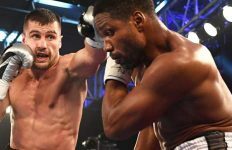 On Saturday night Bob Arum’s Top Rank and J Russell Peltz’s Peltz Boxing Promotions over ESPN will feature WBC World Light Heavyweight Champion Oleksandr “The Nail” Gvozdyk, 16-0 (13), of UKR, out of Oxnard, CA, making his first defense against No. 8 challenger Doudou Ngumbu, 38-8 (14), of the Congo, living in Toulouse, FR, over 12 rounds at the 2300 Arena in South Philly. In the 12 round co-feature No. 5 WBC Welter Kudratillo “The Punisher” Abdukahorov, 15-0 (4), taking on IBF No. 6 Keita Obara, 20-3-1 (18), of Tokyo, JAP. Three ten rounder’s on the undercard will be featuring Philly Welter southpaw “The New” Ray Robinson, 24-3 (12), taking on WBO No. 1 Eqidijus Javaliauskas, 21-0 (17), of LITH and Oxnard, CA. 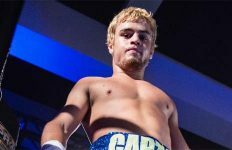 In ten rounder’s Welter Christian “Solide” Mbilli, 13-0 (13), of Cameroon, living in Montreal, CAN, taking on southpaw Humberto “Cachoritto Betillo” Gutierrez Ochoa, 33-7-2 (22), of Sinaloa, MEX. Welter Fredrick “General Okunka” Lawson, 27-1 (21), of GH and Chicago, IL, taking on Juan “El Nino” Ruiz, 21-4 (13), of VZ and Tijuana, MEX. Super Light Jose “Chino” Lopez, 11-1 (9), of Humacao, PR, taking on southpaw Askhat Ualikhanov, 4-1 (2), of KAZ and Oxnard, CA. Others on the undercard feature Philly southpaw Donald “No Love” Smith, 8-0 (5), Joshafat Ortiz, 5-0 (3), of PR/Reading, PA, Cassius Chaney, 14-0 (8), of New London, CT, Philly’s Sonny Conto, 1-0 (1), and debuting Jeremy Adorno, of PR and Allentown, PA.